Kyoaji means “Taste of Kyoto”. Kyoto itself is a Japan's former capital city and seat of the Imperial Court over a thousand years. 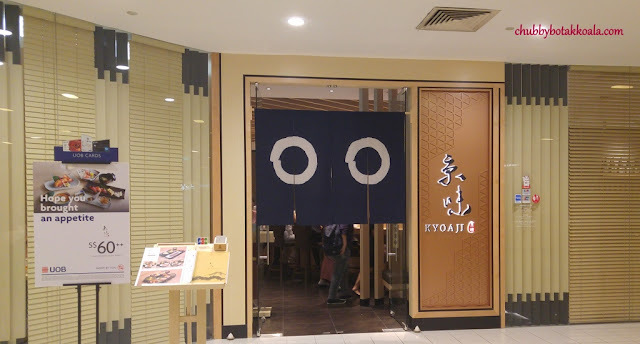 Kyoaji Dining drew inspirations from the rich culinary tradition in Kyoto and combine it with different cooking styles and ingredients from around the world. Heading the restaurant is Executive Chef John Phua and his team. The same group of people that we have seen with during the Fukuichi days. We started with Kani Tofu ($6). A smooth looking round tofu that reminds you of burrata cheese. The tofu is smooth, topped with pungent century egg sauce. Hidden inside the mild-looking tofu is none other than spicy crab stick. A good starter with a mini surprise inside. Sashimi Moriawase (Jyo - $88). It is a premium assorted sashimi, which include Hotate Gai (Scallop), Maguro Otoro (Tuna Belly), Shake Harasu (Salmon Belly), Mekajiki (Swordfish), Aji (Horse Makararel), and Ama-ebi (Sweet Prawn). You will notice that there are two stalks of Perilla flowers. You supposed to put it between your palms and rub, so it releases the minty aroma and gives the sashimi additional freshness. Each cut of the sashimi is generous, fresh and definitely pleasant to eat. I personally loved their scallops and the horse mackerel. From the price point, it might be slightly higher than normal but the quality makes it worthwhile. Fagura Chawan Mushi ($25). 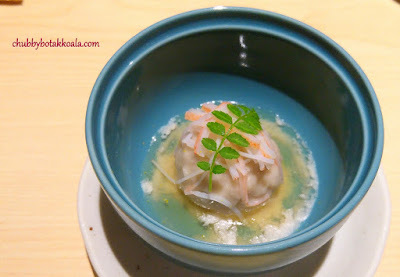 A swanky version of Chawan Mushi. The version here is topped with creamy foie gras sauce and mini bits of well-seared foie grass, love the fragrance of the unique foie gras sauce. This is definitely not your regular steamed eggs. Caterpillar Maki ($20). Presentation wise, this maki definitely looks like a caterpillar. Each layer of the avocado is thinly sliced and covered the roll. The unagi and crispy fried prawn in the middle gave the roll a crispy texture and the OMPH feels to it. Shiro Maguro Maki ($22), Seared White Tuna Roll. The fillings of this roll are crab stick, cucumber and pickle radish. On the top is seared white tuna. Considering the creamy texture of the white tuna, the searing process and pickled radish nicely naturalised the overwhelming taste. The maki is topped with different colour of prawn roe for the salty and popping feel to the dish. Niku Fagura Sauce ($35). A signature dish from Executive Chef John Phua. Niku Fagura Sauce is grilled beef cube with foie gras sauce. The beef cube is tender, grilled to medium rare. It is juicy and tender, but the creamy foie gras sauce is just amazing. Yum Yum, still as good as before. Foodgasm!! Ebi Teppanyaki ($22). A perfectly grilled prawn coated with creamy tobikko sauce. There is a nice smokey aroma to the dish, followed by juicy and succulent prawn meat. I only wished there are more. Imo Manju ($16 - Special request). Chef John Phua interpretation of Orh Nee, although the version here more towards the salty version. 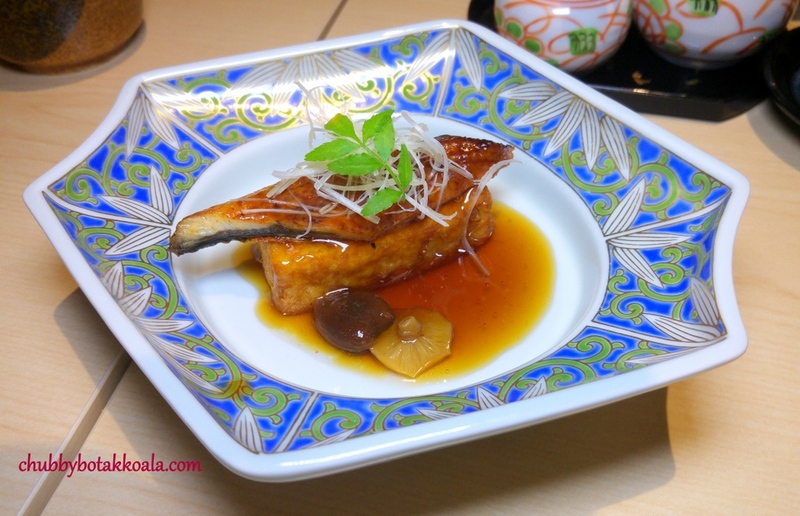 The yam paste is smooth and creamy with hidden unagi inside it. The stock added to the dish are clear and robust, with the crab stick provided the natural seafood sweetness to the dish. Although it is a good and flavourful dish, my taste buds keep referring back to the sweetness of orh nee. Unagi Tofu $16 (Special request). A solid combination for fried Japanese silken tofu with unagi. The unagi is perfectly grilled, where the meat just melts in your mouth. While the tofu absorbs the some of the unagi flavours making it taste like homemade seafood tofu. A good dish indeed. For those customers that have followed Chef John Phua, you will know that the décor of his restaurant has always been simple and zen-like. It is bright and comfortable while allowing the food to speak for itself. In case you are wondering, the best seat in the house is at the sushi bar where you will get the chance to be personally hosted by the Chef himself. Overall, it was a delightful experience dining at Kyoaji Dining. For those looking for a quality Japanese meal, it is definitely a place to go. The pricing is on the high side however, you are paying for quality. Kanpai!! Cheers!! Thanks to HungryGoWhere and Kyoaji Dining team for the tasting invitation. Check out the Set Lunch promotion starting from $16++ and Third set lunch ordered will be complimentary. Reservation has to be made from HungryGoWhere here. Available until 31 March 2017.